UCLA, Ohio State and Oklahoma are pretty much strangers to the Bottom Ten_except in the category of some famous rivalries. The above three all play in traditionals in which they have losing records. Yes, that's "The" Ohio State, which more often than not gets whipped by The Michigan. Oklahoma is below.500 lifetime against Texas. One of the biggest losers in well known traditionals is UCLA, which has an overall 31-44-7 record against USC. One reason is that UCLA, founded four decades after USC, posted a 2-13-3, pre-1950 record vs. Troy. The beginner Bruins lost their first two games to the Trojans by scores of 0-76 (1929) and 0-52 (1930). The series was so one-sided that USC refused to play UCLA again until 1936, when the Bruins were starting to get their act together. Of course, now that UCLA has won its last 3 games against USC, perhaps it's time for the Bruins to propose a break in the series so that USC can regroup. One of the oddest rivalries involves MIT and Caltech. 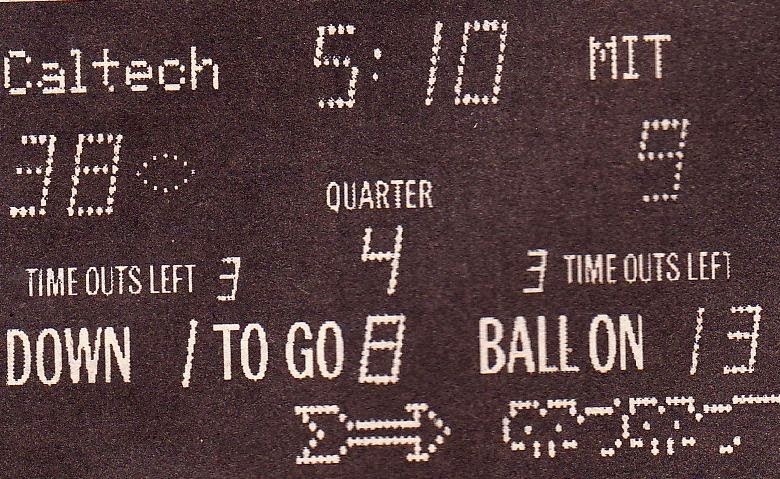 During the 1984 Rose Bowl, the Pasadena scoreboard announced that Caltech was leading MIT, 38-9 in the fourth quarter (see above). Actually, it was a hoax_UCLA was leading Illinois by that score. Caltech pranksters had re-wired the scoreboard to make it appear that Caltech was playing MIT. But the Bottom Ten doesn't quibble over such minor details. The BT charged MIT with the loss. 6. USC ................(35-45-5, .438 vs. Notre Dame). What a performance by the Raiders' defense against St. Louis. The Rams were just 1 for 8 trying to convert third-down situations into first downs. True, the Rams didn't particularly care because they led 38-0 at the half and increased the lead to 52-0. At that point, I think, the NFL "mercy rule" was called and the game was declared over. (I forget who brought snacks for afterward). For the Raiders the good news is they won't be able to match Detroit's 2008 record of 0-16. Somehow the Raiders have already won a game this year. Oakland, it goes without saying, is the Bottom Ten leader, followed by the N.J. Jets. The Jets_and GM John Idzik_were so excited abut the recent invention of the forward pass the team actually threw 13 times against Miami, completing seven for a whopping 65 yards. Somehow the Jets lost, 13-16. They're just one slot ahead of their New Jersey brothers, the Giants, who blew a 21-0 lead and fell to none other than 2-10 Jacksonville, 24-25. Afterward, Giants RB Rashad Jennings said, "I don't know an English word to explain the way we feel." As usual, the French have a word for it: terrible. 1. 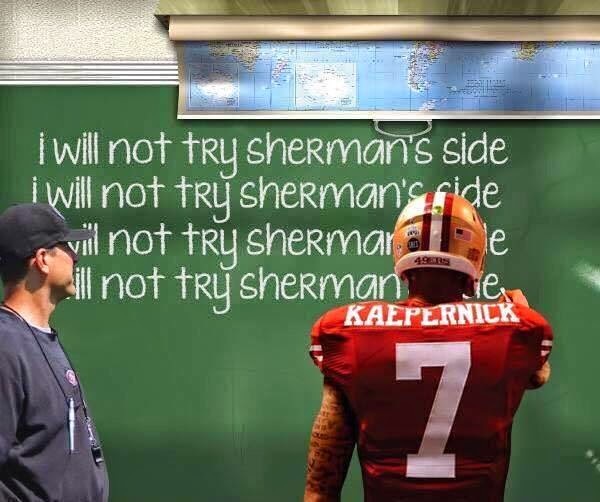 Oakland (1-11)........... 0-52, St. Louis............ S.F. 6. Tampa Bay (2-10; 7. Jacksonville (2-10; 8. Carolina (3-8-1); 9. Chicago (5-8); 10. Idle. Special Citation: Dwight Perry of the Seattle Times notes: "In four games against Seattle over the past two years, 49ers QB Colin Kaepernick has completed more passes to the Seahawks (5) than his own receivers (4) in the 15 times he's tested cornerback Richard Sherman. " Thus he's had to stay after school (see below). Your Official Bowl Bottom Ten!